5.7.5 is 12% to 15% worse than 5.6.21 at 1 thread. I hope we can fix this via bug 74342. Page size (16k, 8k, 4k) has a big impact on the peak only when compression is used. The test server has 40 hyperthread cores and is shared by the sysbench client and mysqld server. I used my sysbench 0.4 fork configured to fetch 1 row by primary key via SELECT and HANDLER statements. 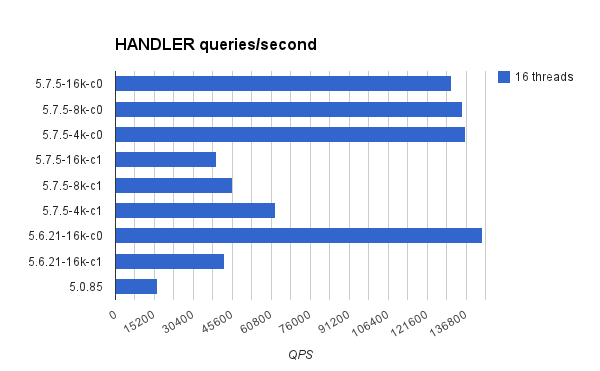 The InnoDB buffer cache was 1G with innodb_flush_method="" (buffered IO). There were 8 tables in the test database with 16M rows per table. The test database was either 32G uncompressed or 16G compressed so tests with compression had a better InnoDB buffer pool hit rate. Tests were run with 1, 8, 16 and 32 threads. 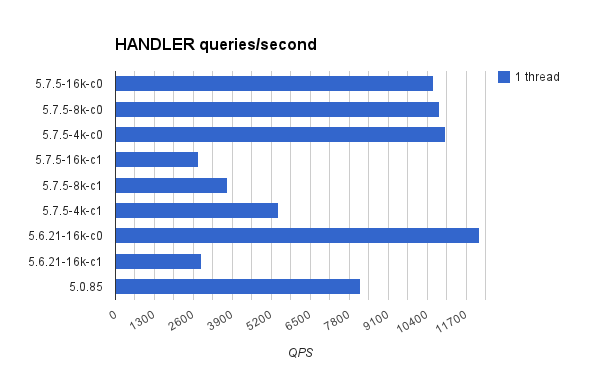 The 1 thread test was limited to 1 table (2G or 4G of data) so this benefits from a better InnoDB buffer pool hit rate. 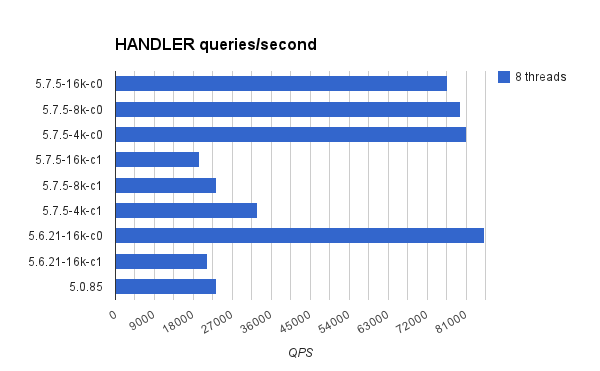 The 8, 16 and 32 thread tests uniformly distribute clients across 8 tables. Tests were done for MySQL 5.0.85, 5.6.21 and 5.0.85. All versions were tested for 16k pages without compression (see -16k-c0 below). 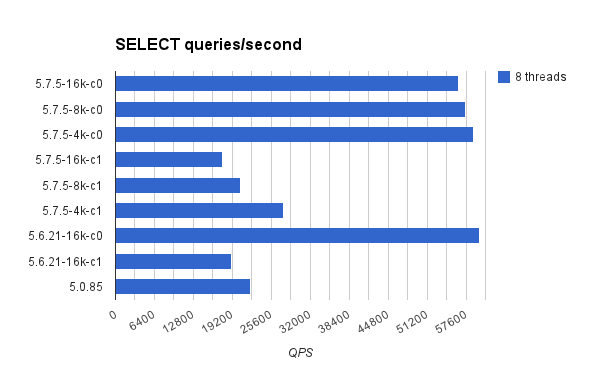 Some MySQL 5.7.5 tests were repeated for 8k and 4k pages (see -4k- and -8k- below). 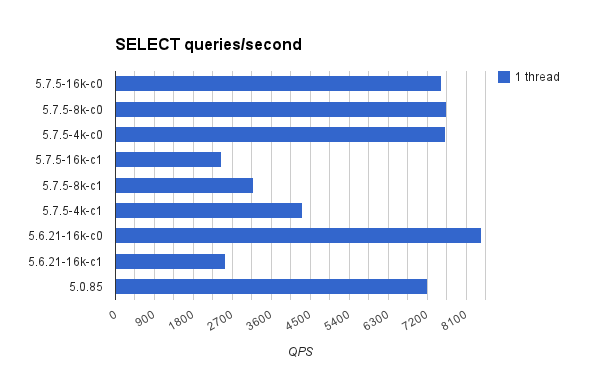 Some MySQL 5.7.5 tests were repeated for 2X compression via zlib (see -c1- below). The results at 1 thread show that peak QPS for 5.7.5 is 12% to 15% worse than for 5.6.21. I hope this can be fixed. I assume the problem is a longer code path from new features in 5.7. The difference between 5.6.21 and 5.7.5 is smaller than at 1 thread. I assume this is the benefit from less mutex contention in 5.7.